I am hooked on seamed sweaters. Like really hooked. They are brilliant. And so fast. 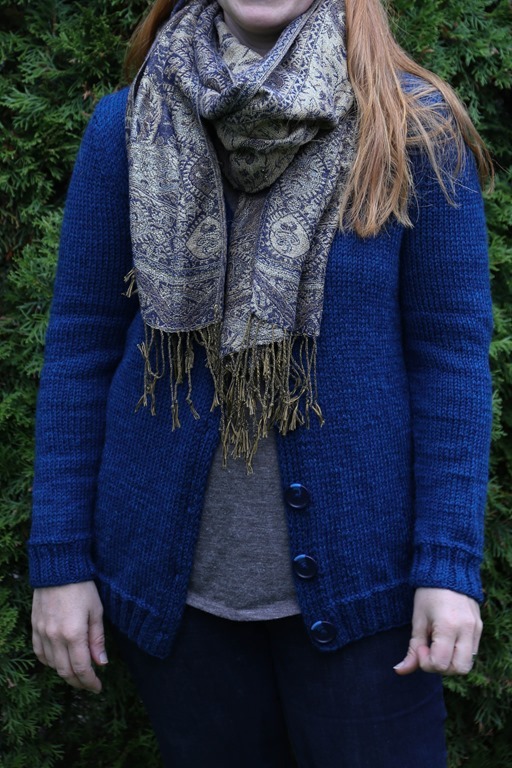 I knit this in about 10 days! I’ve had this yarn languishing in the my stash, which was originally meant for a sweater for one of the men in my life. In the end, I just never ended feeling inspired enough to cast on. Over and over I came back to maybe knitting something for myself. In the end, I did! 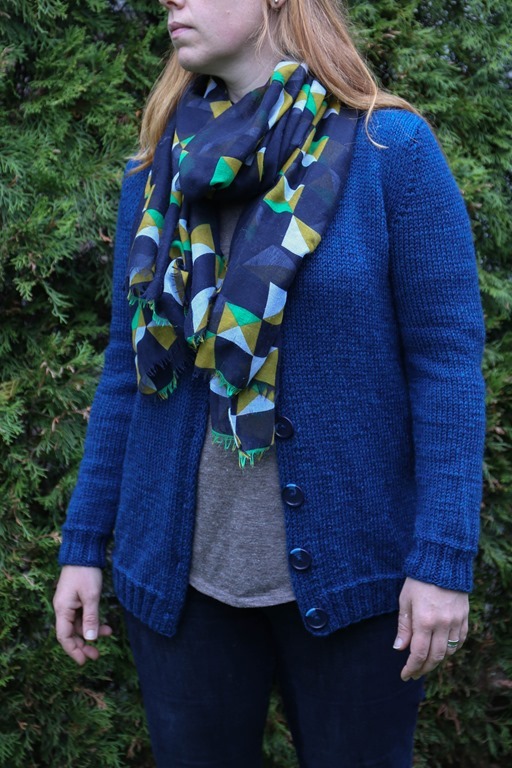 After taking the Craftsy class from Amy Herzog on Sweater Modification, I felt really inspired to give her recommendations a try. M measured me based on her instructions (yes, I made him watch that part of the video!) and then cast on for my now-felted sweater. But it gave me the template for more sweaters! For the ‘vanilla’ v-neck, I added a purl row for a cuff detail on the sleeves and hem. As well, I did a seamed button band rather than a picked up 2×2 rib. I had buttons in my stash that I had originally picked for this yarn. They are slightly too big but the nice thing about that is if I do button it, they won’t pull out when I’m moving around (I’m notorious for choosing too small buttons, usually!). I started the v-neck decreases 1” before the armhole shaping. The sweater is 21” long from hem to underarm. It’s the perfect length for a ‘play’ cardigan for me when I’m with the kids. For the v-neck decreases, I worked them every row 8 times, then every other RS row until I had decreased to the number I needed at the shoulders. As well, I added bust darts, which was a first for me! I added decreases about 1/3 in from the outer edge of the cardigan every other RS row (two decreases total) because I had a little too much fabric over my bust. I love the fit as a result and will definitely do this again. I absolutely love how this fits and can’t wait to wear it. I think it will definitely replace my old Target sweater that I’ve been wearing to death! Thank goodness! This was a great way to start off #slowfashionoctober. Have you tried Custom Fit? What did you think of it? Are you tempted to try it? Previous Post about the house. This is fabulous!! GREAT color and the sweater looks awesome on you. I’m totally inspired to try making a custom-fitted sweater. I’m intrigued by the seamed button band. How does that work? Thank you! 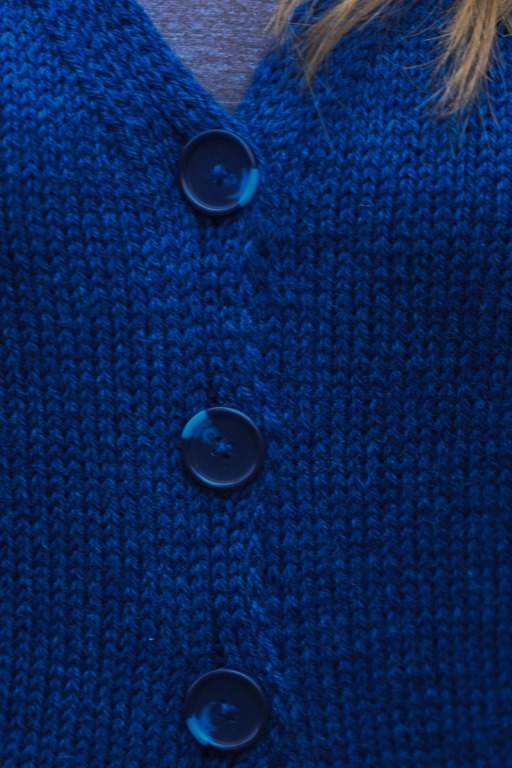 The button band is knit separately and seamed on afterwards. It’s a 1×1 rib. I love these button bands because they look so professional! I’ve been thinking about trying it. Your sweater looks great! Great job! Your sweater looks awesome. I love your sweater. I also made a custom fit sweater in a similar simple style and it fits beautifully. 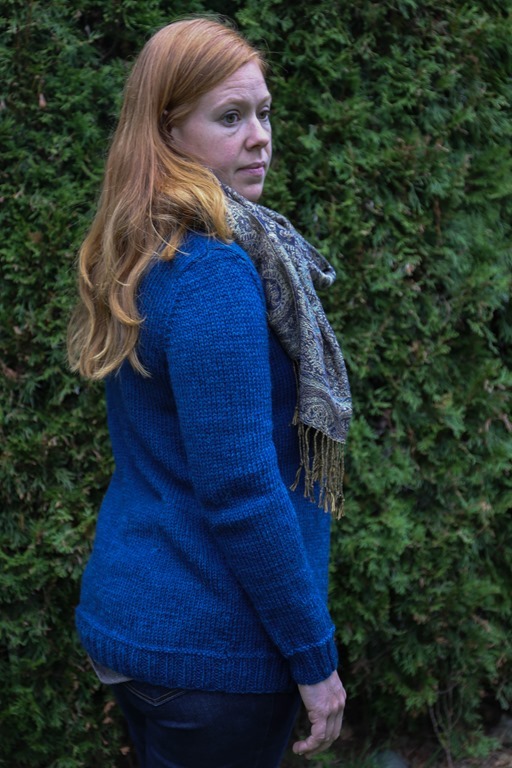 It is the first sweater I knit that my sister said I could have bought in a store. (No surprise there because I almost always knit with my handspun.) I made my sweater in a commercial yarn that was purple. Great fun because I only spin natural colors. 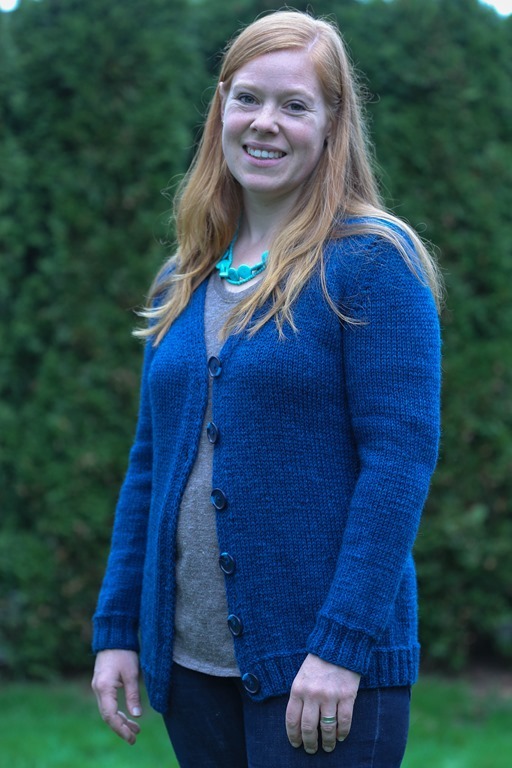 I also seamed my custom fit sweater and find I still prefer to knit in the round with Elizabeth Zimmerman’s phony seams. Love your blog and the video podcasts. I especially love your thoughtful, controlled approach to spinning. Thank you! 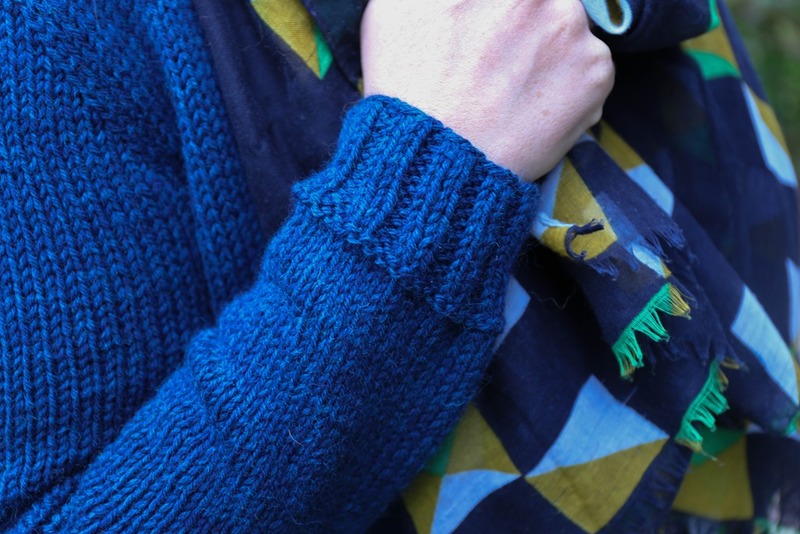 I do love a good non-seaming sweater – they are so great. I think I’m at the point where I not only want really well fitting sweaters but the structure that helps them last with the seams. Thank you for your compliments about the show! I really appreciate it!! !